waste for about 1000 years. ume of nuclear waste doesn’t sound unmanageable: 105 000 cubic metres. Heathrow airport, military facilities, disused mines – they’re all off limits. perhaps deep underground – off limits for 1000 years? waste we already have to deal with, thanks to our existing old reactors. extra energy being released into the environment? Figure 24.13. 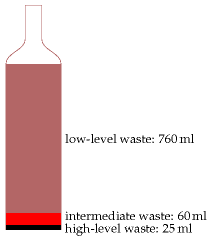 British nuclear waste, per person, per year, has a volume just a little larger than one wine bottle.